One of the most important priorities in building your online business is generating leads, but how do you follow up with your leads via Email that gets you results? How do you write effective emails that not only generate you income and sign people up into your business through the power of written words but also inspire and influence other people to change their lives? That's what this post is all about. 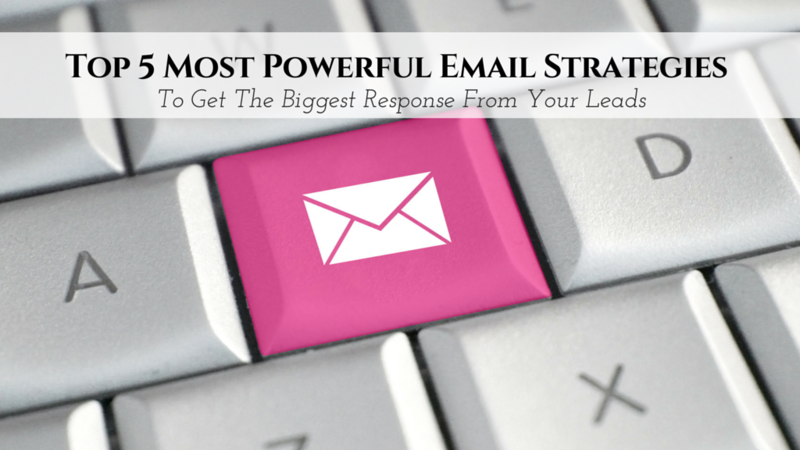 The good news is that you don't have to have a big lead flow to produce big results if you learn simple but powerful email strategies to get response from smaller amount of leads. 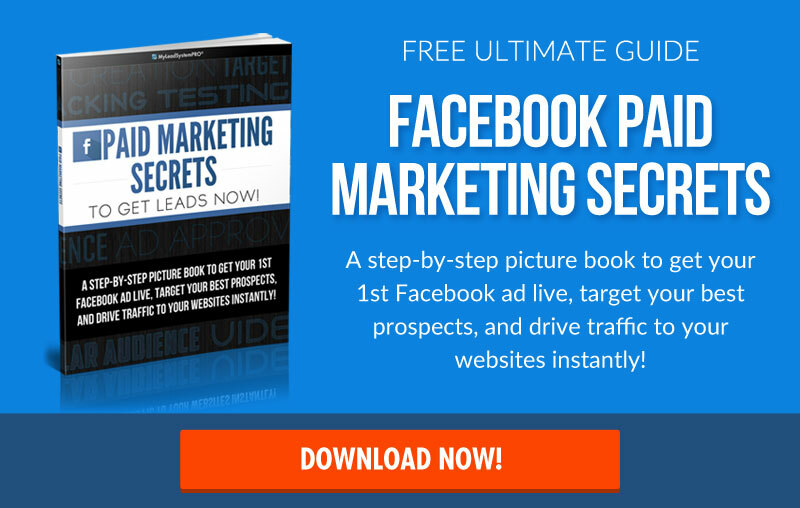 In fact it's possible to build a 6-figure income business just from generating 5-10 leads a day. First I want to emphasize the difference between just copywriting and leadership. Writing good copy will allow you to make sales but what we really want to do is not have people to just buy from us our products and join our businesses but we also want to INFLUENCE people to make better choices in their lives and become better human beings. Your overall intention when you are writing emails matter a lot. If you just want to make a sale or trick people into clicking a link so they watch the sales video and hopefully you get the dollars in your bank account, people will feel it. Set the intention to give to your prospects positive energy, share value with them in the form of stories and lessons so regardless whether they do business with you or not they will benefit from your emails tremendously. Whatever you give always come back to you. Almost every word has an emotion behind it. If you breathe light and love into your words it will go a long way. When you write, transfer the feeling that you have inside your heart and soul and they will feel it. Imagine that you are sending an email and there is an auditorium full of people. Some people real close to you will join your business, but the majority are on the sidelines at the upper levels of the auditorium, they are listening, following you and paying attention. When the times comes they will buy if you have been a positive influence in their lives. Also it's important that you BELIEVE in what you are promoting. If you don't believe in the message, then not any amount of tricks will help. They don't know what you are offering. That's why you need to write good headlines so people open the emails and get your message across well so they have a good idea what you are offering. Or continue to be subscribed if they want. They don't have the money – well there is not much you can do about it, business is a business. They don't believe they can do it – here is where you shine and help people overcome their limiting beliefs that they can actually do it. The best way to write effective emails is always by telling an awesome story. People love real, emotional stories full of lessons and metaphors. People don't want us to just tell them that our business is the best, they want to figure it out on their own, and the best way to do it is through a story. Remember that we want to build relationships with people on our email list and get them to know, like and trust us. What is a better way for someone to know, like and trust you then to send out stories about you and your life? Russell Brunson in his book DotComSecrets calls it daily scienfield emails. Remember the T.V. show Scienfield which basically was not about anything in particular just random happenings in people's lives? So you want to look at your life and find inspiration in it, some lessons you can draw from it. What is happening in your daily life pay attention to it cause you can use it in your emails! Kids for me are a never ending source of inspiration. So when you are sharing a story, think about how it relates to what you want them to click on in your email and how you can transition your story to have people click on the link. The more drama and emotions are in your story the better. Get excited when you are writing your email, get into the right state of mind because excitement is transferable. Also give people a reason why they should click on the link and what they are going to expect to see once they do click on the link. Is it a video they should watch, or read your blog post? Tell them what they need to do and hyperlink those words. When you are writing an email it's a good idea to invoke as much curiosity as possible in people. Let's say you are telling a story and to get the most juiciest part they need to click on the link. Or at the end of your emails have a P.S. line where you say what they are going to expect in your next emails and they will be waiting to open it once it comes! The best way to get your point across is to use metaphors that relate to something that people can understand. Let's say that you want to convey that your compensation plan in your company pays extremely well. Instead of just bluntly saying it you can use a metaphor. You can say imagine we are going to bake a big freedom cake and for that we need flour. One option is that we are going to take a small teaspoon and put it in the mixing bowl from the flour container or would you rather take the whole 1 cup measuring cup to get the flour to the mixing bowl? Well most companies pay teaspoon commissions and we are doing it in cups. See how it better conveys the message? Use skinny columns – it's much easier to read and people prefer it when you have like a newspaper narrow width column. Have Lots Of Space Between Sentences – when you write emails don't do it in long paragraphs, it's very hard to read. Instead write 1-2 punchy sentences and hit the ENTER button to separate the text. Most people are skimming the emails and not really reading every word so make it easy for people. Be Short and To The Point – don't write super long emails or long sentences that can be written in a much shorter way. The more clear and concise you can make the communication the better. Short, sweet and punchy is always better then long choice of words. Emphasize key power words – you can bold, italicize or underline words that convey power like freedom, prosperity, success or whatever you want to really emphasize in your message. If they don't open your emails, they will never even read them so it”s 70% of the game just to get people to open your email. How To Get YAY Without Boo – what is the main benefit and what pain is avoided? Weird – if you can say things like poop in your subject lines it'll definitely stand out! Special characters, emoji, brackets – you can add those signs, emojis that will really help your emails stand out in the inbox. Questions – as a question in your subject line. People love to give their opinions on something. But don't promise people something in the email that you can't deliver on just to get people to open your emails, because this is a good way to lose trust. Email marketing is a very powerful way to build trust and convey your message to your prospects. You want to share stories in your emails, be interesting, exciting and inspiring. Get into the right state of mind before you write and follow the principles I shared in this post. Above all be consistent. Nothing creates more trust then you consistently delivering great value from your heart and you are consistent with your overall messaging. One of the most important things when it comes to building your online biz is generating leads! 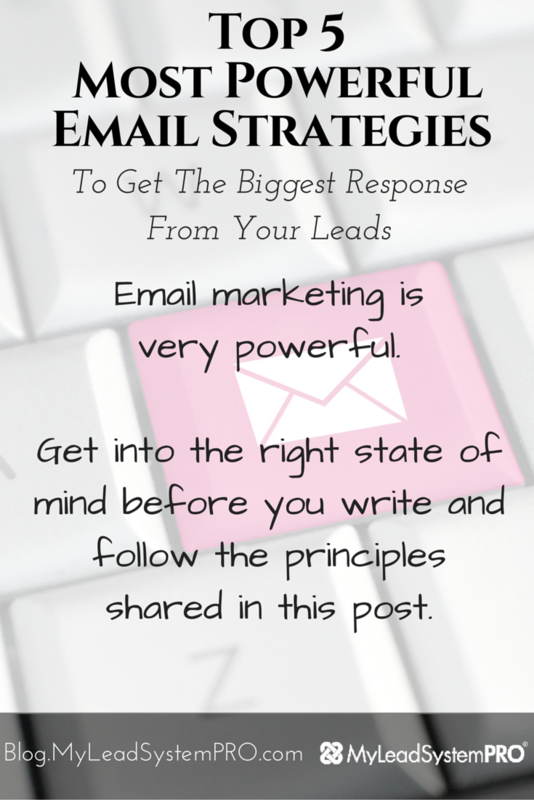 The question is – how do you follow up with your leads via email and get the results you want? Vitaliy Dubinin is a very passionate home business entrepreneur, online mentor, dad and speaker living in Israel with his wife and 2 kids. Thanks to the skills learned in MLSP he went from being a broke student working at various low paying jobs to within 2 years living a life of true FREEDOM. Vitaliy enjoys travelling the world 5-8 times a year, attending live seminars and events, working from his laptop or his home, speaking on stages and inspiring thousands of people to live a FREEDOM-preneur lifestyle as well and actually SEE their kids grow. He has been recognized as one of the top recruiters in the Network Marketing industry sponsoring over 130 people in just 6 months thanks to attraction marketing principles and now he personally mentors people to the top! Vitaliy regularly contributes to the MLSP community to help people achieve success online and he has a Daily Inspiration Show that helps people create breakthroughs in their businesses. YES! E-mail follow-up is so critical because most of your sales will not come from the ‘first-touch’… the tips in this post will most definitely help your e-mail sequence & follow-up process get opens, clicks, and sales! Thank you Vitaliy. A great demonstration that you do not go into this business on your own. There is always sound advice to be given and support from many directions. It’s always up to you, but you are not alone.